01.10.1903 Registered at Hull H 769. 1917 Fred Smith appointed manager. 29.05.1917 Requisitioned as Fishery Reserve Vessel. 28.06.1919 Owned by Wilberforce Steamship Fishing Co Ltd, Scarborough (William F. Smith manager). 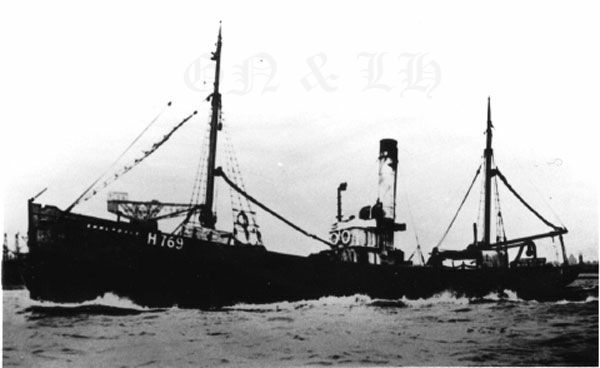 07.1920 Owned by Bank Steam Fishing Co Ltd, London (John Maclean Methven, Grimsby manager). 20.07.1920 Registered at Grimsby GY 1168. 26.07.1920 Mortgaged by Bank Steam Fishing Co Ltd, London (A). 26.07.1920 Mortgagee: National Provincial & Union Bank of England, London (secure account & interest). 18.10.1922 Bill of Sale (under mortgage (A): Owned by Pogson Symonds & Co Ltd, Grimsby . 26.10.1922 Mortgaged by Pogson Symonds & Co Ltd, Grimsby (B). 26.10.1922 Mortgagee: National Provincial & Union Bank of England, London (secure account & interest). 30.10.1922 George William Pogson appointed manager. 24.07.1925 Bill of Sale (under mortgage (B): Owned by Thomas Thomson Brown, Leith Edinburgh. 31.12.1929 Mortgaged by Thomas Thomson Brown, Leith Edinburgh (C). 31.12.1929 Mortgagee: Bank of Scotland, Edinburgh (secure sums due on account & interest). 10.02.1930 Edwin James Walker appointed manager.